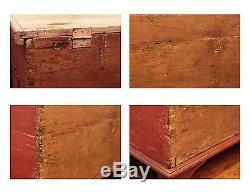 EARLY 1800S ANTIQUE FOLK ART ORIGINAL PAINT DOVETAILED WEDDING TRUNK - 1800's IRON HARDWARE. 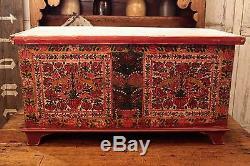 Up for sale is this amazing trunk or blanket chest. 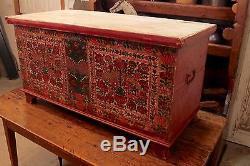 It's a beautiful painted trunk with tons of character and that true folk art flavor. 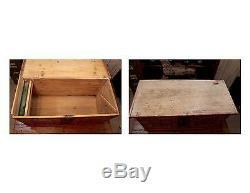 It has a hinged lid as you can see in the pictures. It has little painted steel hinges that are screwed in. The hinges are not original but don't detract from the character of the trunk. 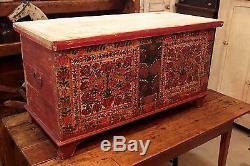 The trunk has a white lid that's been repainted and a wonderfully hand painted red, white, green, yellow and dark color floral motifs. The on the front and sides appears to be all original. 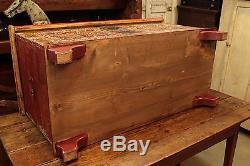 The trunk is dovetailed as you can see in the pictures. The outside and has nicks, chips and scrapes on it as you'd expect from and item of this age. The back is not painted. Inside it's very clean and has a little wooden till on the left side. The till has a lid the flips up as you can see in the pictures. Then, inside the till, there's green paint. Inside on the right side someone added a wood stick to hold the lid up. The stick hinges on a little (and newer) screw. On the outside of the trunk, th. 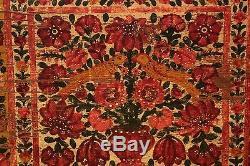 The hand painting is a very colorful collection of flowers and organic motifs. The trunk is wonderfully hand painted. The trunk is very sturdy. On the back of the trunk, the wood has some deterioration on it including a number of worm holes and decay in places. The trunk has a wonderful patina to it. The trunk has some paint wear, paint loss, edge wear, nicks, scrapes, dings, fade, wear and overall age marks. 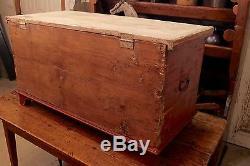 It's a nice size and measures 40.25" L (42.5" at the lid) x 18" D (19.25" at the lid) x 22.5 H. It weighs about 40 lbs. 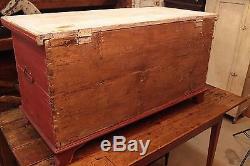 This is a very nice trunk for those of you who love Primitives or folk art. It's one of a kind! It would certainly make for an interesting conversation piece. Thank you for looking at this item. Let us know if you have any questions. 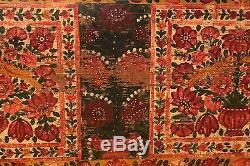 We regularly put up new items so check out our other items. We will do our best to answer your questions. We will handle them on a case-by-case basis. We will do the same. We couldn't sell anything if it wasn't for you and the time you have taken to spend looking at our items. As a very small business we strive to keep you as our customer! We GUARANTEE that your item(s) will be received as described. We work hard to describe them correctly and in detail (note that the pictures are part of the description) with all flaws (if any) exposed. 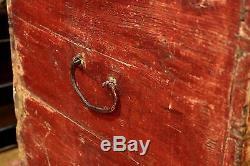 The item "EARLY 1800S ANTIQUE FOLK ART ORIG PAINT DOVETAILED WEDDING TRUNK IRON HARDWARE" is in sale since Friday, April 29, 2016. 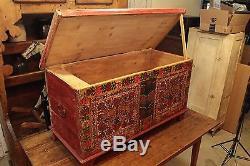 This item is in the category "Art\Art from Dealers & Resellers\Folk Art & Primitives". The seller is "americas-place" and is located in Riverside, California. This item can be shipped to United States.